Pilgrimages are known in all religions. They are an expression of a person who searches for God in places where He has revealed Himself in a special way; where He has offered persons the possibility to feel His presence more easily or with particularly gifted persons, who - through their gifts - have become a special sign of God's presence. This is why there are places of pilgrimage which attract people and where they come in their search to experience God in a new manner, that is, to experience peace, joy, love and hope. With each pilgrimage, a person leaves behind his everyday life, his work, his family, his friends, his security and - longing for a new encounter with God - starts on his journey to places and to people who have proven themselves as "gifted", so as to help him in his new experience with God. Although the basis and the primary motive of every pilgrimage is the longing for God, leaving behind everyday life and opening oneself to God, there certainly are secondary reasons for a modern pilgrimage - getting to know the world, people and their customs. However, if these secondary motives become the most important, then we are dealing with tourism. The primary as well as all possible secondary reasons are greatly helped by the curiosity of a person, which, at the first moment, can override all other motives. Some places of pilgrimage developed because of God's direct intervention into the lives of one or several persons. (This is how most of the Marian Shrines, associated with apparitions, have developed). Alternatively, they developed in the course of time, often after the death of a person especially chosen by God, or even through the charismatic engagement of individuals within the Church. Irrespective of how a place of pilgrimage developed, a pilgrim always searches for the same thing. Because pilgrims come out of different motives, it is the duty of those responsible for the Shrines to help each pilgrim become aware of the true motives of his pilgrimage - the encounter with God who is waiting for each person. Every available means should be employed in order to achieve this so that what should happen, does happen - the encounter between God who is waiting and person who is searching. This is why one should always ask: "Who is the person? What does he want and what answer is God offering him?" The special spirit of our pilgrimage enables us to say that - man in himself is THE QUESTION AND SEARCHING OF THE ANSWER, WHILE GOD IS THE ANSWER AND THE EXPECTATION OF THE SEARCHER. Man is a spiritual and a physical being. He was given an intellect, a free will and a broad spectrum of spiritual experiences. Man carries in himself a profound longing for self-realization. He continuously seeks this realization and what he is searching for can be explained in this manner: Man is a being who longs for peace. That is why, one can say, without a doubt, that a persons home is where he finds 'his peace'. The search for peace is the main motive of every human activity, and that, for his entire life. We know from experience, that man is prepared to do every good thing, even to sacrificing his own life, when he feels 'peace' on that way. However, we also know that, if man has not found this peace, even if he has done good and opened himself to positive human values, he will start to look for this peace in a world of the negative and the destructive. In this way, a person seeking peace is capable of destroying himself, others and everything around him. If one looks at the development and growth of a person from the moment of his conception, then one realizes that he needs peace in order to be able to develop and grow at all. When the mother is at peace, then also the child she is carrying under her heart will enjoy this peace and will be able to develop 'happily'. But, if the peace of the mother is disturbed for any reason while she is carrying the child under her heart, then the child no longer feels good and is born with profound consequences of restlessness, from which he sometimes will not be able to free himself for the rest of his life. After being born, the child wants to be accepted and loved so that he can continue peacefully with his life on this earth. But we also know from experience, that many children feel restlessness within themselves, caused by jealousy, as soon as they realize that their family is expecting a new child. It is only after the jealous child has experienced that it is not being threatened, but even enriched, by the newborn and it continues to feel loved and accepted that peace returns to the child. As he grows up and develops, nothing changes. The person only expresses his restlessness in another manner and searches for his peace in another way - either in a positive or in a negative way. Here we are confronted with a fundamental question: Is the person an exile who lost his "peaceful home" a long time ago and is now trying in any way possible to find it again, or was he born with the longing in his heart to find the peace that goes beyond all promises that the world in which he lives offers him? We do not want to analyse all anthropological and psychological theses and questions now, since they all have one thing in common: the concrete person, who has been given an intellect, a free will and a soul wants to live in peace; but the world, which he experiences empirically, does not completely assure him of this peace and this is why he is tirelessly searching for it and cannot free himself from the desire to make the realization of this peace. In order to experience this peace and to be able to remain in his "peaceful home", all segments of the person, that is his intellect, his free will, his mind and his soul, have to be satisfied. In this, human beings differ fundamentally from the animal kingdom. Animals do not venture outside themselves in order to find peace. In order for them to be at peace, it is enough that their hunger is appeased, their thirst quenched and their instinctive needs are satisfied. Even the most bloodthirsty animals forget their aggression as soon as their instinctive needs are satisfied. We should not forget that anthropology, psychology and sociology all try to convince human beings that they only need a little more than the animals in order to find peace; but this 'little more' does not surpass the horizons of this world. And again, our experience shows us: the more satisfied a person is on a physical-instinctive level, the more restless, aggressive and dangerous he becomes towards himself and his surroundings if his being is not permeated with the spiritual reality. The biblical image of man is transcendental. God created man in His image (cf. Gn 1,27). God gave man the possibility to collaborate with Him and, together with Him, to find peace and happiness on this earth. Man was placed in this earthly Paradise where, in friendship with God, he enjoyed peace. However, something happened which the Bible defines as Original Sin. Man made a mistake by reaching for something forbidden, thus destroying his alliance with God and their reciprocal union. He could no longer stand God's presence because His footsteps and His presence frightened him and he, therefore, had to hide. The consequences for man were grave. He does not want to admit his sin and puts the blame on someone else: the man, Adam, on his wife, Eve, and Eve on the serpent-Satan, who deceived her. And man loses his peace, his existence is threatened because everything has turned against him and he has to leave the earthly Paradise, his "peaceful home" and, as an exile, he is exposed to difficulties, problems, hard labour and has to eat the bitter, hard earned bread (cf. Gn 3, 17-19). According to the Bible, man once enjoyed peace, lost it and was driven out of Paradise and so became an exile. His exile became a pilgrimage for him because God did not abandon him but gave him hope, by announcing a woman with a child, who will conquer evil and return man to the lost Paradise, a new "peaceful home". The entire Biblical history speaks of man who wanders in search of God who manifests Himself and who goes towards man, offering him peace. According to the Bible, man stands between the recollection of life in Paradise and the internal need for eternal peace, promised already on earth, but only revealed in the Eternal Kingdom of God, the kingdom of peace, justice and truth. The prophets were continuously striving for peace, they prayed and sang about the peace that, in His love, God will give His people. All the prophetic expectations should have been fulfilled in the Messiah, who was to come and create new conditions for the realization of the final, messianic peace. In the tradition of the Bible, various places of pilgrimage are mentioned; places where people come to search for their God and an encounter with Him. Mention is also made of religious encounters, of pilgrimages. One of them is Shechem, where God's people gathered in His Shrine and where the alliance with God was formed (cf. Jos 24,25). In addition to Shechem, Bethel (1 Sm 10,3), Beersheba (Am 5,5), as well as Ophra and Zorah (Jgs 6,24 and 13,19f) are also mentioned as places of gathering. Later, all shrines were abolished and the Feast of Passover (1 Kgs 23), the Feast of Weeks and the Feast of Tabernacles (cf. Dt 16,1-17) were introduced which are being celebrated in Jerusalem. There are two reasons for such gatherings: to assemble the people before their God and to protect them from idolatry and heresy. So the Temple in Jerusalem remains as the only place of pilgrimage. A multitude of people from Palestine and from the Diaspora gathered around the Temple with the same goal: that the people may maintain the right faith and not wander away from their God. Those were days of prayer and adoration of the true God, days in which devotion to the Holy City was expressed and a deep togetherness of God's people was realized. Pilgrimages are not realized only as an actual visit to a holy place, where God manifested Himself, but are also an eschatological event. One talks about "a day of salvation" which is envisioned as a gathering of pilgrims of all nations and of unbelievers. In Isaiah, the Lord says, "I come to gather nations of every language; they shall come and see my glory. I will set a sign among them; from them I will send fugitives to the nations: to Tarshish, Put and Lud, Mosoch, Tubal and Javan, to the distant coastlands that have never heard of my fame, or seen my glory; and they shall proclaim my glory among the nations. They shall bring all your brethren from all the nations as an offering to the Lord, on horses and in chariots, in carts, upon mules and dromedaries. To Jerusalem, my holy mountain..." (Is 66, 18-20). And the prophet Micah writes, "It is the day; and they shall come to you from Assyria and from Egypt, from Tyre even to the River, from sea to sea, and from mountain to mountain" (Mi 7,12). Jerusalem, built as a city with compact unity. I will pray for your good." Biblical revelation makes it clear, that man is called upon to do everything on his part in order to accept what God, in His love, has prepared for him. For this reason, man is called to conversion, as a way to peace, on which he leaves everything behind that is hindering him from experiencing and living peace. In order to succeed in this conversion, which means to abandon this world and its promises and to open oneself to God, who is peace, an individual, a family and, from time to time, also the entire people did not only have to pray but also to fast, to believe and love, to reconcile and forgive, to finally overcome all difficulties and to find the peace which God promises. And all this occurs in a special way on a pilgrimage. Pope John Paul II writes about the pilgrimage of Israel in the document Pilgrimage in the Great Jubilee 2000, No. 8: "To the people of God, the victims of discouragement who are burdened with unfaithfulness, the Prophets also proclaim a messianic pilgrimage of salvation, open to the eschatological horizon, where all peoples of the world will gather on Sion, the place of the Word of God, the place of peace and hope. Reliving once more the experience of Exodus, the people of God must permit the Spirit to liberate them from a heart of stone and give them a heart of flesh. On their life's journey, they must express justice and a jealous faith. They must become a light for all people until the day, when the Lord God will offer 'a banquet for all people' on the holy mountain." Through history, in the fullness of time, God Himself becomes man through His Son, Jesus Christ, and goes towards man whom He wants to bring back into the "peaceful home". So, one can say that Jesus Christ is also a pilgrim; however, with different connotations. During his pilgrimage on earth, He did not search for God but for man and offered him the divine, simple way to peace, which comes from God, because He gives peace (cf. Jn 14,27). His incarnation is the beginning of a pilgrimage which continued at the moment when Mary and Joseph brought Him to the Temple to present Him as their firstborn son, according to the Scriptures and the law, requiring each firstborn son to be presented to the Lord (cf. Lk 2,22-26). When he was 12 years old, Jesus continued on his pilgrimage. In accordance with the law, He went with His parents to Jerusalem (cf. Lk 2,41) to pray in the Temple, according to the customs of the feasts, "Thrice a year shall all your men appear before the Lord God" (Ex 23,17). From time to time, during His public life, Jesus set out on pilgrimages on various feast days (cf. Jn 2,13; 5,1 ff). Jesus' ascent on the mountains, His fasting in the desert and His death on the mountain outside of town are stations on His pilgrimage, which ends on the hill of Ascension (cf. Mt 5,1-2; 4, 1-11; Jn 19,17; Acts 1,6-12). In short, the purpose of a pilgrimage is the search for God who manifested Himself at different places, in various ways and at various times. In order for such an encounter with God to occur on the pilgrimage journey, man has to leave his everyday life, set out on his journey and celebrate his faith in prayer and cultic celebration, so that God can liberate him from his old sin and evil and, to again, together with him, set out as a pilgrim on the journey towards the Kingdom of God. That is why in places of pilgrimage, 'divine service' has to be formed which is to become a 'human service'. From what we have said so far, it is clear that - due to his anthropological-psychological and religious-spiritual reality - everything has to be done in order to motivate a person to take a step forward, to open himself, to accept, to encounter and to remain on the way towards God, who remains faithful to him. God manifests Himself in places of pilgrimage in exceptional ways through the Bible and special people. This is what motivates a person to abandon his everyday life and to turn towards such places. God first offers man His presence with the intention that, in his search for this loving presence, he will find Him. In the experience of this loving presence, man will empirically experience liberation from the burdens, which accumulated on his earthly pilgrimage as a result of his own weakness and sinfulness, as well as the sins of the others. After one has experienced the liberation from the burden of one's sins and their consequences, one should follow the experience of peace, joy, love, hope and trust and should accept the presence of the Lord in one's life. One should do everything possible in order to remain in this presence, even if life is not always easy. Even if one is separated from the divine presence, one should again begin to search for and realize it. The more profound the experience of peace and love is, the easier it is to remain on the way with God and to fight against everything that separates from God. So that man can break away from the embrace of sin more easily and to free himself from its consequences, each place of pilgrimage should offer various forms of meeting with God. According to the Bible and the experiences of the Prophets, there is first of all a CALL to leave the city, to abandon everyday life and to search for a place of peace and silence. In other words, to go into the desert, then to set forth and to climb the mountain where the Prophets prayed and encountered the Lord, returning again to their place and city to continue their task. Nonetheless, in the practice of the biblical pilgrimage, the Temple was the most important centre where the faithful gathered. At these places where the faithful were called, they PRAYED AND FASTED. Offerings were made in the Temple, where the cult was celebrated and where there was RECONCILIATION WITH GOD AND MAN. Following this, the faithful returned renewed and ready to ACCEPT their tasks, to do good and to think of the orphans and widows. In other words, on the one hand, man comes to the place of pilgrimage with his wishes, but burdened with his difficulties and his sins and their consequences. That is why it is necessary to make it possible for him to remember to see everything in the light of God's love and mercy and to experience the truth of Jesus' words calling all those who labour and are burdened to come to Him, so that He can give them rest and peace (cf. Mt 11,28). The pilgrim must be helped on his pilgrimage journey to be able to walk on the ways of the biblical pilgrim, to take the time, that is, not to permit him to do everything hastily, as if he were a tourist looking at general points of interest. He must pause and take his time; he must climb the mountain; in the Temple, he must meet the Lord who forgives and gives him back his peace. In light of what we have said so far, it is not difficult to understand what is happening in Medjugorje and what must happen; that is, how the divine service should be formed and why it has to be formed, what form it has today and why Medjugorje offers what it does. The fact is that no other Shrine, and thus also no other Marian Shrine, has developed or is developing, as Medjugorje has. I also dare say that not a single one represents the ideal form of a place of pilgrimage, taking into account man's search for God who offers Himself, as is the case in Medjugorje. (One possible exception could be pilgrimages to the Holy Land, because there, meetings are possible in places where God revealed Himself and where Jesus worked). The first apparition of Our Lady took place on the mountain Crnica, which today is called Apparition Hill. She called us to peace, prayer and fasting, faith and love. She appeared to children, who are already adults today, whom one can meet and with whom the pilgrims are also meeting. Everything began with the call to peace and belief in God in a country where atheism was the official ideology. On the one hand, the government reacted vehemently against it but, on the other hand, the crowd felt an unbelievable urge to come and see, to experience and respond. According to his nature, man searches for peace. Through the Queen of Peace, God offers him this peace, thus fulfilling his deepest desire as a fullness of physical, psychological and spiritual good. People began to move. In a biblical sense, Apparition Hill is also a Bethlehem - an invitation to peace with the birth of Christ and, as a mountain, it is an invitation to set forth and go up. On Apparition Hill, a pilgrim experiences the first call and the first opening of his heart under those "conditions so well-prepared" for that. It is a place where man experiences joy and peace and there is not a single pilgrim who does not visit it. For this reason, a well-organized pilgrimage must include the "setting forth and going up" of this mountain. On Apparition Hill, the joyful and the sorrowful mysteries of the Rosary are prayed and one remains in silence at a place, which is marked as the place where the visionaries saw Our Lady. One must take one's time when ascending Apparition Hill but, especially at the apparition site itself one needs much time in silence. In this silence, one should read some of the messages of Our Lady and think about them. One should consecrate oneself to her, that is, consciously accept her as a Mother, because it is at this particular place that she so often said that she is our Mother. Here, one should open oneself to her blessing, as he so often repeats in her messages, "I bless you with my motherly blessing". Here, at this same place, it is also good to make the decision to accept Mary as our Teacher, because she teaches us and leads us to her Son. As important as it is to come here with a group, it is equally important to come alone, to pray, to remain with Jesus and Mary while praying the Rosary and to hear her voice calling us to peace. This is the same peace to which the Angels called us when Jesus was born. It is particularly recommended to pray for peace at the cross opposite the second station of the joyful mysteries because it was here that, on the third day of the Apparitions - on June 26, 1981 - Marija Pavlovic saw Our Lady with the Cross, crying and repeating: "Peace! Peace! Peace! Only Peace! Peace between God and man and peace between men." Many pilgrims also go to Apparition Hill at night and relate wonderful experiences in prayer. Thus, what Jesus often did is being repeated in setting out at night to pray on mountains. In the course of time, another place for silent prayer has evolved, where many individuals and smaller groups also spend time in personal prayer. Its name was given accidentally, because someone had placed a blue cross at the spot where Our Lady appeared when the police had forbidden any gatherings on Apparition Hill. Here, Ivan's prayer group met many times when the meeting was only for his prayer group and Our Lady would appear to Ivan during this meeting. Also in this place, as in all other places of prayer, one should spend time in prayer, in silence and remain in an atmosphere of prayer. Mirjana also often prays at this spot on the second of the month when she meets with Our Lady and prays for the non-believers. All these inspire the pilgrim to "set forth" for this spot and to pray there. There is also a practical side to this place of prayer. Those pilgrims who cannot "ascend" Apparition Hill or Mt. Križevac because of their physical condition are often able to make it to the Blue Cross and can experience prayer on the mountain here. After the encounter on Apparition Hill, where the first call was heard that resounded in the hearts of the visionaries and later in the hearts of millions of pilgrims, the biblical pilgrimage continues. The pilgrim who comes, burdened by weaknesses and sins, wounded by the weaknesses and sins of others, must continue on the way, which is also the way on which Jesus passed after Bethlehem. This way led Jesus over another mountain and to another ascent with the Cross to the top of Mt. Calvary. The pilgrim who follows the pilgrim Jesus "sets forth and ascends" Mt. Križevac. Here, one is able to encounter Jesus who suffers and dies; who passes His test as the King of Peace while on the Cross, by accepting His suffering with love, by praying and forgiving. Mary is also here, suffering and remaining faithful to her Son; loving as He loves, praying as He prays and forgiving as He forgives. In the light of Christ who thus passes through the final portion of His pilgrimage, a pilgrim recognizes, on one hand, the immeasurable love that suffers for him and on the other, the human evil, in which he recognizes himself, his own behaviour and the behaviour of others. This realization does not leave any bitterness in his heart because Jesus also did not die in bitterness. This realization awakens the desire to forgive and to seek forgiveness and reconciliation. In ascending Mt. Križevac, the pilgrim comes in contact with death and life, transition and eternity, love and hate, prayer and condemnation, reconciliation and revenge, violence and mercy, poverty and greed, weakness and power, truth and lie, the tomb and the resurrection, the goodness and malice of man, the fall and the ascent. Through such an encounter on Mt. Križevac, the pilgrim's heart opens toward God and is ready to repent for his sins, to forgive and to ask for forgiveness. Here, the person understands his own way on earth with God and others. Without such an encounter, a person would not be able to get in touch with his own suffering nor would he be able to open himself towards God, due to his sufferings and misfortunes. In this way, his soul is being prepared for a new encounter, which takes place in the Temple. One should set aside a great amount of time for prayer on Mt. Križevac. Here, the Way of the Cross is prayed, consisting of 16 Stations. The first Station shows the Garden of Gethsemane and the last, the Resurrection. One should pray in front of each Station and reflect about Jesus and those around Him and through all that look at oneself, one's own behaviour and those around him. If one climbs Mt. Križevac in this manner, then that which should happen in him, does: the recognition of the redeeming love of Jesus, the recognition of one's own sin and weakness and of the need for salvation. It is especially important to pray for faith so that everything turns to the good for those who love God. One does not go on Mt. Križevac to liberate oneself from one's crosses, but to learn how to carry them and to help others carry theirs. When climbing Mt. Križevac, it is particularly important to pray in silence in front of the cross in order to consciously unite with Mary who remained under the Cross and called us also to come before the Cross and to pray. In deep meditation before the Cross, one's own wounds and the wounds of those whom we have wounded, as well as the sufferings of the family, the Church and the world are presented to Jesus. Especially here, one should pray for spiritual and mental healing. This is a place of complete composure and spiritual seriousness. Therefore, it is not in the spirit of a pilgrimage to talk, eat or drink on Križevac or under the Cross, as many unfortunately do at the end of their ascent. It is also in complete contradiction to the spirit of a pilgrimage to sell or buy anything or to leave one's garbage there. One should also descend Križevac in a composed manner, just as Mary descended from Calvary after all that she had endured and after she had buried her Son. While descending, one could pray the Chaplet of the Seven Sorrows of the Blessed Virgin Mary. After such an ascent and descent from Mt. Križevac, the soul of the pilgrim is ready for new encounters. In church, the pilgrim encounters the resurrected Lord, who gives His disciples the power to forgive sins and to nourish the faithful with the celebration of the Holy Eucharist. The first part of the evening program consists in praying the Rosary. This is the time of preparation for the Holy Mass. Our Lady herself asked us to prepare ourselves for Holy Mass. During this time and in this atmosphere of prayer, many faithful go to confession. Also during this time of preparation in prayer is the time of the Apparition. The faithful gather because Our Lady is coming. She prays and blesses everyone and in this way, with her presence. She prepares the faithful for the celebration of the Holy Eucharist. Holy Mass is celebrated so that all faithful of various languages can participate as actively as possible in its celebration. The gospel is read in the respective languages of the pilgrims and, in as much as it is possible, so are the prayers of the faithful. The songs, likewise, are chosen so that the greatest number of pilgrims can participate. After the Holy Mass, the Creed, seven Our Fathers, Hail Mary's and Glory Be's are prayed followed by the prayer for healing. Our Lady asked us not to leave the Church immediately after Holy Mass, but to remain with Jesus. This is the best time to pray for healing, because before Communion we said to Jesus, "Only say the word and my soul shall be healed!" During this prayer, many inner healings occur and there have also been physical healings. Finally, the Glorious Mysteries are prayed. They are prayed at the end of the evening program and at the end of the day so that the soul and heart can anticipate what awaits one after death; to participate in the celebration of the Risen Lord, and to cast one's spiritual glance towards Mary, as she is gloriously assumed into Heaven and crowned as the Queen. In this manner, the heart and soul open to the life of God and the hope that console and give the strength and the courage to continue on the earthly way until the final victory. Our Lady asked for such a program. That is why it needs to be recommended to the pilgrims to participate in the entire evening prayer program. It is not so important that every word be understood, since a mystery cannot be understood but can only be comprehended with one's heart. Everyone who has participated in the entire evening program knows how important this is for a pilgrim. Some pilgrims do not take part in the evening Holy Mass with the excuse that they do not understand or that something else - a meeting or an evening meal - has been organized at that time. There are also those who remain at the evening program but walk around the Church during Holy Mass, waiting for the healing prayer. This must be avoided. One should remain for the entire evening program so that one can comprehend what Our Lady desires. In Medjugorje, for the first time in their lives, many pilgrims have experienced the true meaning of Adoration of the Most Holy Eucharist - the encounter with Jesus who has remained with His people in the divine bread. In all his encounters on Apparition Hill, on Mt. Križevac and in Church, a pilgrim encounters himself in various dimensions and speaks with God of a new beginning in his life - which is the ultimate goal of every pilgrimage. She also asked the parish to have adoration every Thursday after Holy Mass. Thursday is always a special day for the Holy Eucharist and the priesthood. Our Lady speaks about her presence during these moments and she also asks us to fall in love with Jesus in the Holy Eucharist. Only someone who is in love has time. In the course of time, adoration was also introduced Wednesday and Saturday evenings and on the vigil of great feast days. In the Adoration Chapel, many pilgrims find a moment of silence and encounter Jesus in the Holy Eucharist. Many pilgrims have discovered adoration for the first time in Medjugorje and have taken it back into their own prayer groups and, in due time, also into the parish community. There already exist groups of pilgrims who have organized perpetual adoration in their parish communities. Adoration is actually an encounter with Jesus in the Eucharistic Bread. When the pilgrim is in adoration alone, it is good to remain with Jesus in silence with as few words as possible. Often the experience of St. John Vianney of Ars is mentioned: "I look at Him and He looks at me." To remain in front of Jesus in silence means to enter into the mystery of His Eucharistic presence, to avoid all haste - be it interior or exterior - and to experience eternity. If adoration takes place within a group, it is necessary to have short meditations which help enter into the presence of Jesus, as well as meditative songs and long periods of silence. Adoration should not be overfilled with reflections as if it were a homily. One should not pray the Rosary or the Litanies but should use the simplest possible prayers and songs so that the soul has time to enter into the silence. When organizing a pilgrimage to Medjugorje, one should see to it that the pilgrim does not get caught up in too many talks, visits and the like. Instead he should be helped to also find time for this way of encountering God. In addition to the encounter with Jesus on Mt. Križevac, where the pilgrim encounters the suffering Jesus and follows Him on the Way of the Cross, there is in Church every Friday after Mass the Veneration of the Cross, followed by prayers for healing. This is also another good opportunity for a pilgrim to encounter the Cross of our Lord, Jesus Christ, from whom salvation comes and to remain in front of this sign of His love. This is also an important part of the pilgrimage program because it can easily happen that the average believer does not encounter the suffering Jesus at all. A person who does not unite with the suffering Jesus will have difficulties entering into the mystery of love, which suffers, and triumphs through the resurrection. If one looks at the Thursday, Friday and Saturday evening programs with adoration and veneration of the cross, one will actually recognize the three solemn days before Easter - Holy Thursday, Good Friday and Holy Saturday - with the liturgy of the vigil and the waiting for the Easter morning. Thus, Sunday morning can be a joyful victory over evil and sin, death and darkness, because one has gone through the sufferings with Jesus of Holy Thursday, the day of the institution of the Holy Eucharist; of Good Friday with His death, and of Holy Saturday with the preparations for the Resurrection. In this way, one can discover the fullness of the school of Our Lady. She wants to lead us and help us to encounter Jesus, who is our life and resurrection. The Medjugorje pilgrim, in addition to having an opportunity of being at the places where God has come closer to man through the apparitions of Mary, can also meet the individuals through whom He speaks to us through her - the visionaries. They are important witnesses and a great help on our way to encountering God. Therefore, their testimony is of great importance. Their basic assignment is to simply transmit Our Lady's messages and to talk about their experiences in their encounters with Mary. But both the visionaries and the pilgrims have to take care not to go beyond the limits of the messages and their personal experiences. It would be quite dangerous if the visionaries would become experts for all questions, giving all the answers. Then it could easily happen that the encounters with them would turn into encounters with someone who knows everything or that they would turn into oracles, where people only look for answers without listening to the messages. This would confuse the pilgrims because they would not be able to distinguish between the message of Our Lady and the personal opinion of the visionary. Certainly, in these meetings there is present a curiosity that motivates the pilgrims. In itself, curiosity is something positive, as it motivates the pilgrim to decide more easily to "step out of his everyday life". But this curiosity has then to become the motivation for further encounters with God, who speaks to His people in this manner. (Who would not be curious to meet a person who claims to have daily encounters with Our Lady?) Curiosity enables a person to hear and listen and understand more easily what God is saying. That is why it is important to continue the way across the mountain to the encounter in the Church where one experiences the Sacramental reality. I am convinced that it is sufficient motivation for a pilgrim who comes to Medjugorje to meet with only one visionary. One should avoid constantly running after the visionaries and over-rating their importance. There is a danger of a "circle of friends" being formed around the visionaries who could be tempted to take advantage of their proximity to the visionaries, by portraying a special image and position so as to enable business and profitable gains off the pilgrims. For example, by making a pilgrim who is staying in one of the visionaries' homes pay more or feel particularly privileged. Such and similar dangers have to be avoided for the benefit of the visionaries, the pilgrims and, finally, for the benefit of the messages they are transmitting. It is a fact that many pilgrims who come to Medjugorje testify to having seen special signs in the sky or at the Cross or to have felt the presence of Our Lady and her call with a great intensity. Although it is, of course, not easy to assert objectively what is happening, one must still emphasize that this also constitutes an important factor of the pilgrimage. However, here also the rule applies that the ultimate criterion is what the pilgrim does after having experienced the extraordinary interventions of God. Here, one can also include the spiritual, mental and physical healings. Those who have experienced such healings, by their testimony awaken the faith and the curiosity and inspire people to leave their everyday life and tasks and to go to the people and places, which, through the intervention of God, have become the goal of many pilgrims. A special sign of the pilgrimage is the message of Our Lady to fast with bread and water. Bread is the basic food of man and, thus, also the symbol for life. Also water is irreplaceable in the life of man. It is above all a symbol for spiritual cleansing. These two realities and signs already contain a message: return to life and live, come forth from your impurity and be cleansed. Simply stated, we are called upon consciously to live for two days only with bread and water. This is the ideal fasting. A person who takes this literally and can live this surely only does something good for his soul and his body. However, one must still take into account one's daily life, problems and difficulties. This call is surely an invitation, which is to be responded to in the fullness of freedom and responsibility. Bread and water were also the staple food of the pilgrims in the old days. One could not carry anything else when travelling by foot for several days or weeks. Thus walking and living with bread and water, a person became cleansed and more able to encounter God. He left his everyday life and visited the places, where God revealed Himself, and the persons to whom He appeared. Avery important encounter for the pilgrim is for him to meet with the youth who are in the community of Sister Elvira. They give a concrete testimony of their drug addiction and of their way out from death to life, from their complete enslavement, from crime and atheism to the freedom and peace, that God gives when man opens himself to Him. Here, many pilgrims, especially parents, become aware of their role and realize their possible omissions in the way they raised their children, but they also see the hope that everything can be turned to the good. For young people, this meeting is also very important because in the honest confessions of the addicts they recognize and understand all the dangers of modern evils of drugs and alcohol. Individually and together they are proof of what happens to man when he encounters God and decides for Him. After such a meeting at this community, it frequently happens that a pilgrim wants to go to confession and have a talk with a priest because he has realized his mistakes or because he needs advice. This station on a pilgrimage through Medjugorje helps many people: they return home, conscious of their responsibility and of the dangers that can detain a person on his way to peace, because each type of dependency can be recognized in that a person has become dependent, imprisoned and closed in the horizons of this world. Here, the profound longing to continue on the way of freedom and the decision to fight against enslavement manifests itself. All this takes place and forms the place of a pilgrimage and the way of a pilgrimage with all the dimensions man has within himself. If we consciously think about the fact that this is happening at the end of the twentieth century, everything becomes even more interesting and more comprehensible. Today a person searching for God is inundated with a multitude of offers in his daily life which threaten with losing the sense for life, and falling into deep hopelessness, with suffocation and death in the end. The further he distances himself from God, the more he searches for Him and the more sensitive he becomes to all the proposals that offer him any security and that promise peace. More and more, a person departs from his daily routine, if not as one searching for God, then certainly as one indulging in the intoxicating means that estrange him from himself and from all human and Christian values, thus imprisoning him. Drugs and alcohol, sexual saturation and hedonism, the pursuit of power and money are nothing but a "pilgrimage" away from reality into non-reality, from hope into hopelessness, from creative collaboration with God to destructive behaviour against oneself and others. The increasing number of suicides and the legalized killing of unborn life, even at the moment of birth, are nothing but an attempt of man to create a new space for himself where he believes he will be able to escape the monotony of his imprisonment within the horizons of this world. The violence, which emerges in wars and daily murders, is also proof that the framework in which man lives has become too small and that he is searching for an appropriate space to live - but always without God. Aside from these catastrophic attempts of man to somehow escape from his daily life, the theories of "New Age" are emerging and are being accepted at the end of this century and millennium because they promise people salvation and peace - but without conversion to God. Many meditative movements, which attract people and particularly the young, promise peace and salvation, by turning to oneself and finding and activating one's own powers and energies. While some promise a new epoch to come, others foresee catastrophes and apocalyptic events, in which many people and many nations will be wiped out from the face of the earth and only some, or the chosen lucky ones are to survive. Pope John Paul II tirelessly invites all Christians and all mankind to prepare themselves for entry into the third millennium, but together with Jesus and Mary. The Encyclical Mother of the Redeemer (1987) speaks of Mary who is on pilgrimage with the Church which is living the Second Advent, and who, as Mother, Teacher and Pilgrim, is preparing the Church for the 2000th birthday of her Son. As the Mother and Teacher of Jesus, she is the one who can best prepare us for the encounter with Him, as she knows Him better than any other saint. "Dear children! Today I invite you to come still closer to me through prayer. Little children, I am your mother, I love you and I desire that each of you be saved and thus be with me in Heaven. That is why, little children, pray, pray, pray, until your life becomes prayer. Thank you for having responded to my call." Thus, Medjugorje is a place of pilgrimage in the real sense of the word, concerning the revelations of God, human needs, the possibility of encountering God and also in answer to the invitations of the Pope to prepare the world for entering the third millennium. One should point out the dangers that arise at any place where many people gather. Medjugorje is no exception. On the one hand, care has to be taken that the messages remain pure and that their concrete application to the Liturgy be clear (prayer, mass, adoration, confession, ascent of the mountains). On the other hand, the protagonists should remain humble and open instruments through whom God works. In any case, care should be taken that the messages are not suffocated by materialism, a spirit of tourism, a chase after money and commercialism. 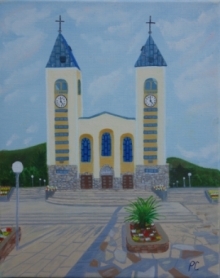 Those accompanying pilgrims should be warned that this not become a "business" for them and those who accommodate pilgrims should not forget the reason for their coming to Medjugorje. It is obvious to everyone that, wherever there is a chase after money and a worldly competitive spirit is present, the true spirit of a pilgrimage is in danger. One should be particularly careful that human curiosity is not misused but channelled and directed in the right way. It can be said without exaggeration that in Medjugorje, the spiritual aspect is still recognizable and that the above-mentioned dangers have not succeeded in suffocating it. After returning home, pilgrims have to take care to continue to live in the same spirit and to refrain from fanaticism and elitism, that is, not to found groups separate of the parish community. A pilgrim should decide for personal and family prayer, he should join a prayer group and, as much as possible, create similar conditions for prayer. Medjugorje was not given to mankind in order to know better than others, but in order to better live the Gospel of Jesus Christ, the only Saviour. Aside from possible exceptions, one can without exaggerating also say that everywhere there is an effort to remain in the spirit of the messages of Our Lady and to continue to live the Gospel. Here also, Medjugorje has created something, which is of exceptional importance. The priests of Medjugorje and also some of the visionaries partake in encounters throughout the world, where thousands of faithful gather and are helped to remain on the right way. It is something no other Sanctuary has. This meeting also has no other function than to make us more conscious of our role in this magnificent divine intercession and that we fulfil it with dignity. In the hope that through Mary, God will continue to lead us in what He has begun here, we say with her: "Your will be done! I am ready to do everything you tell me to. Help me to understand what it is that you ask of me.